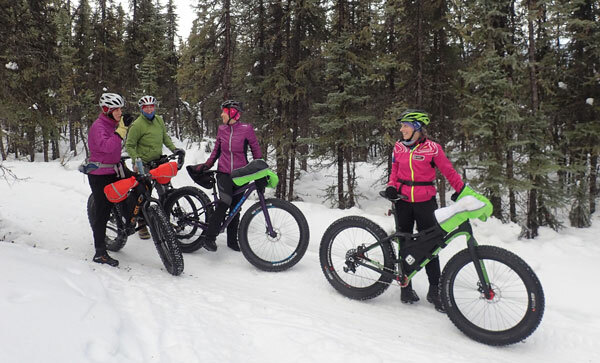 Fairbanks Cycle Club is all about riding, and boy, do we have a lot of rides year ’round. The list here is rides that we typically do every year; some years the creative leaders among us come up with new things to do, and sometimes we take a breather from a particular ride for a year or so. Be sure to check out the calendar to find what’s scheduled and where to meet up with the group. Everyone is welcome to any of our rides, but keep in mind that some might not be good choices for novice riders, while others are targeted at them. Check with the ride leader to find out if a ride is right for you! Some of the rides are also races, and some races are also rides. Nothing like being vague, huh? Chena Hot Springs Bicycle Classic — Both a ride and race, for kids, families, enthusiasts, and hard-core-go-fast types, with varying distances from Fairbanks to Chena Hot Springs. Tuesday Night Mountain Bike Rides — Also known as “Doug Rides” after their namesake, Doug Burnside, the Tuesday Night Rides are attended by mostly men and not enough women. Check the ride descriptions for ride ability levels, length, projected durations, etc. Rides tend to be more difficult as the season wears on. Check out the schedule to see where to meet and where we’ll be going. Women on Wheels — A moderate to fast-paced series of road rides for women who like to test themselves. The ride schedule gives a lot of details about rides, mileages and meeting places. Ladies of Leisure — A decidedly mellower version of the WOW rides. Focus is on fun and sticking together as a group. See the LOL schedule for special rides, details on course, miles, meeting places and more. SCUM Rides — Sounds bad, but the rides are fun. This clean group of well-attired men meet on UAF campus twice a week, and go at a pace that works for (almost) everyone. You’ll have to attend a SCUM ride to find out where the name “SCUM” comes from. Spoiler: It’s not as scary as it sounds. Wednesday Night Road Rides — This a group that does “50% training, 50% social,” according to the ride coordinator. Meet at Mushers Hall on Farmer’s Loop at 6:30PM. Figure on 20 miles on a typical evening. Saturday Morning Group Road Rides — And then there’s the Group Road Rides which are intended for road race training. The group starts fast and then turns the screws. Anyone who wants to learn to ride hard is welcome, provided you don’t mind getting dropped. No offense intended, that’s just the way it goes. Sunday Winter Rides — Starting the first week in November and going until early April, this group meets at noon at Ivory Jacks parking lot out in Goldstream. Soft, churned snow means a slow ride, hard pack means a pretty good pace. Rides are on trail as much as possible. Figure anywhere from one to five hours, your choice. Everyone is welcome, fatbikes recommended.